Navigate the map and add your destinations or filter the places by category. 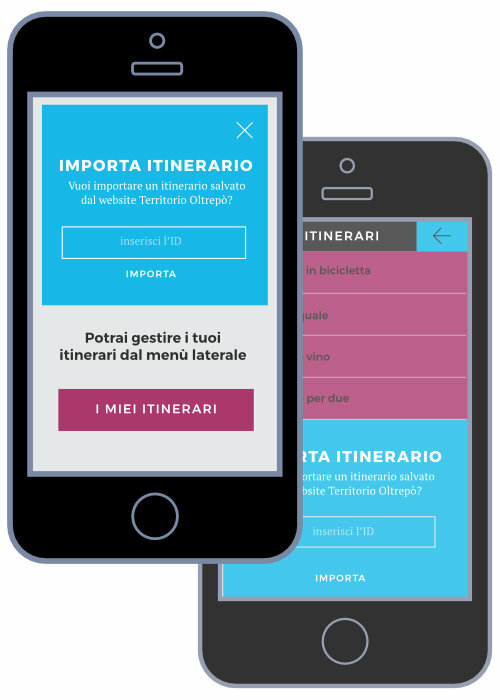 Then download the Qui Oltrepò app and bring your itinerary with you. Don't know where to start? Let yourself be inspired by our itineraries. Download the App, enter the ID and follow this route from your smartphone! Check out the most unique wine & food tasting routes, and the most breathtaking sightseeing destinations, and organize your own visit of this surprising corner of the Po territory. All that remains of the monastery that was founded in 1007 by Tedald of Canossa and abolished in 1797 on the orders of Napoleon Bonaparte are the more characteristic sites of monastic life. They have been restored and are now included on the museum itinerary, allowing for an immersive experience in Benedictine life that is epitomised by the motto “Ora, lege et labora” (Pray, read and work). Ostiglia is located in an area of distinct agricultural and zootechnical vocation: "Ostiglia" rice, pig farm, agnolini, lambrusco and grain, as well as local and delicious desserts populate the local menu. Giovanni di Niccolò Luteri, commonly known as Dosso Dossi (San Giovanni del Dosso, 1474 - Ferrara, 1542), was an Italian painter. He was the main artist in the Este Castle in Ferrara in the early sixteenth century, the era of Ariosto, whose fantastic stories was a striking interpreter. His works are exhibited in the most prestigious museums around the world. The Po river WWII museum is a centre devoted to the memory of the war events that took place in the areas along the great river during the Second World War. The history of the church of san Lorenzo began in the Early Middle Ages when a church was built, event mentioned on documents of 980. Matilde di Canossa had a church then built in Romanesque style, probably in 1082. Recipe based on vino cotto, wine and tortelli filled with beans and dried chestnuts. Set up in 2005, the Park covers an area of around 1,200 hectares, including territory from the municipalities of Quistello, Quingentole, San Benedetto Po and Moglia, and encloses agricultural systems and natural river environments. The wilderness area is characterised by territorial geomorphology dominated by tight meanders of the river and major hydraulic systems, testimony of the thousand-year-long work by the people of the Mantuan Oltrepò to manage the waters. Palazzo Ducale dates back to the second half of the 14th century and was born from the transformation of the ancient fortress, wanted by the Marquis Ludovico II Gonzaga on the project of the architect Luca Fancelli,. The fortress tower, 1125, is crenellated “alla guelfa” and equipped with a bell cell. From clay pit to a place for the history and nature of the Po Plain. The museum is located in the G. Pascoli former Elementary Schools of the Nuvolato hamlet, a building designed by the artist himself between 1929 and 1930, and inaugurated in 2005 to host its many works. The collection consists of 400 works including sculptures, engravings, drawings and paintings. The drawings are populated by cows and peasants, made of daily gestures, of small affections, shown with the strength and intensity of those who found the right key to reading. The sculptures, modeled with the clay from the rivers Po and Secchia, capture the strength of the earth making the poses full of vigor and passion. Gorni's works offer us a very special view of the twentieth-century peasantry. The Special Protection Zone "Viadana, Portiolo San Benedetto Po, Ostiglia" is divided into four large territories - only partially belonging to the territory of Oltrepò - and belongs to the European Ecological Network Natura 2000. The Museum of the Towers, as well as allowing the view of the remains of the castle, let people admire an extensive landscape of the Plain, characterized by the Po river. The exhibited elements, in their complexity, also characterize it as a Local History Museum, where to retrace, particularly through the findings found in Ostiglia and in the Castle area, the past of Ostiglia, from the Middle Ages to the 19th century. Public Astronomical Observatory operated by the Astrophilic Mantuan Association. The observatory is open to visitors on Saturday night between 21:00 and 24:00. Inside and on the initiative of a Professional School, in 2001 the free subject Art Exhibition called Art in Arts and Crafts was born. The School of Arts and Crafts, in fact, created the Prize open to all artists and designed primarily for young people seeking a way to be known to the general public. The Civic Gallery of Modern and Contemporary Art opened in 1975, and it became a museum in 2002, making more than 800 works available to the public, and the number is continuously expanding through private donations and acquisitions, not to mention from the prize that still runs every two years. The Palazzina Mondadori in Ostiglia, in Art Nouveau style, was the site of Arnoldo Mondadori’s first printing works. Now restored, it hosts his personal and private library made up of around 1,000 books, some signed by the authors themselves. Established in 1998, the Archive is dedicated to Giovanna Iris Daffini and it holds materials from traditional folk balladeers and authors: texts, documents, photographs, articles, specialist magazines and a considerable amount of audio-visual documents. Santa Maria da Valverde is a Gothic-Romanesque treasure in the countryside of San Benedetto Po. The place still embodies the name that defines it: a lush greenery of meadows and cultivations, in the middle of which stands the little church, whose current shapes date back to a restoration of 1445. The interior decoration made up of the great fresco in the apse represents the Annunciation with the figure of the Eternal Father on the extrados and busts of prophets on the arch. "Ladies and gentlemen, your presence in this house, softens my soul that is filled with reverent homage and it makes up for so many years of tireless work. It is my duty to thank the Honourable Senator, Mr Fornasari, Mr Monicelli and Mr Bresciano for the undeserved honours that they have paid me and for attending this party here in my home." Taken from the speech given by Bisighini for the villa’s inaugural party. San Colombano Park covers an area of about 730 hectares in the municipality of Suzzara, in the floodplain near the villages of Riva and Tabellano. The area houses several riparian forests, poplar groves, arable land, wild willow groves, sand, wetlands in the vicinity of old clay quarries. The most remote trace of human settlement in the area dates back to the Mesolithic period around 10,000 years ago. The museum includes exhibits dating back to the Bronze Age grouped according to function (ceramic, tools made from bone and horn, fumaroles, loom weights, etc. ), Iron Age objects (from the Etruscan and ancient Veneti civilisations) and a rich collection of Roman artefacts when Hostilia, as it was known in Latin, enjoyed considerable prosperity thanks to the fertility of its soil and its role as a port of call on the River Po, at the point in which the via Claudia-Augusta, coming from the Danube through the Adige valley, crossed the Po. The rooms are equipped with a rich array of educational material. The quantum leap of the extremely slow but progressive mechanization was also given by large-scale reclamation and irrigation works started after the Unification of Italy. In Moglia di Sermide you will find the suggestive Water pumping plant of La Gonzaghese (1907), and the Water pumping plant, 1922-26. A journey in twelve Churches of the Matilde period. Tangible trace of the Canossa's influence in these lands, they attest of a great past that shaped this territory. San Benedetto Po is among the natural, architectural and artistic wonders of its territory, full of history and suggestions. Gorni's night, in Nuvolato di Quistello, on September 28th 2013. The mulberries, the cemetery, the elementary school: three places to tell the poetics of the Quistelle artist by resurrecting the emotions of the gestures and the Gornian signs accompanied by shards of theater, dance, poetry and video.